FEATURES/SPECS Our Golfer's Survival Kit is the perfect gift for the links lover in your life. It has everything he (or she) will need from tee off to the 19th hole. This unique gift kit includes 4 golf tees, a divot tool, two ball markers and (most importantly) a 6 ounce liquor flask with a belt loop. they'll be able to tee off, replace divots, mark putts and ease their pain, all from one handy gift kit! What if I want to order 16 of these, but all with different engraving text? How do I go about placing all of those on one shipment? What you'll need to do is enter the engraving for the first flask by check the Personalize It box on the item page. Once you've entered your engraving, add the flask to the shopping cart. In the shopping cart, hit the Keep Shopping button. This will take you back to the item page where you can enter the engraving for the second person and add the flask to the cart. Keep doing this until you have added all of your engraved flasks to the shopping cart, at which point you can check out and have them all ship together. Please let us know if you have any questions. Thank you! Where is the "Personalization" positioned? Is there a limitation? The engraving goes right on the face of the flask. You can have 3 lines of up to 20 characters per line engraved on the flask. If I just want the initials for the personalization do I just put it in line 1 while ordering?? Yes, exactly. Add the initials to line 1. We'll size and center them accordingly. From what I can see this item has been out of stock for about a year and a half. Do you have any information on this item and when it will be in stock? You keep saying 2-3 months and that has clearly passed. This has finally shipped from our wholesaler and is due to arrive here in about one month. It was inadvertantly left off our last shipment about 6 months ago, which is the reason for the continued delay. Sorry! When do you anticipate this item being restocked? We have it on order from our manufacturer but it is going to be about 2 to 3 months before its in stock. When do you expect to get this item back in stock? It is going to be at least 2 to 3 months before we have this flask back in stock. I have been waiting for this to be back in stock since last November, that's about 5 months, I'm looking to buy multiples yet every time they are out of stock any idea when to expect them back? We don't have an ETA on this, I'm sorry. Our wholesaler keeps pushing back our ship date. As soon as it is in stock, we'll have it orderable on our site. This item is still not in stock and I need one desperately.. When will it be back?? I'm so sorry, we don't have an ETA on this item. It will be at least 2 to 3 months. Are you getting this item back in stock because according to the answers on your Customer QA it's been over four weeks and there is still none in stock. When will this item be back in stock? We should have this back in stock in about one week. As soon as it is back in stock, we'll make it orderable on our site. Is there a way that I can either reserve or be contacted when this item in once again in stock? There is no way to do that, however, we should have a large amount of these coming back in stock in late November. 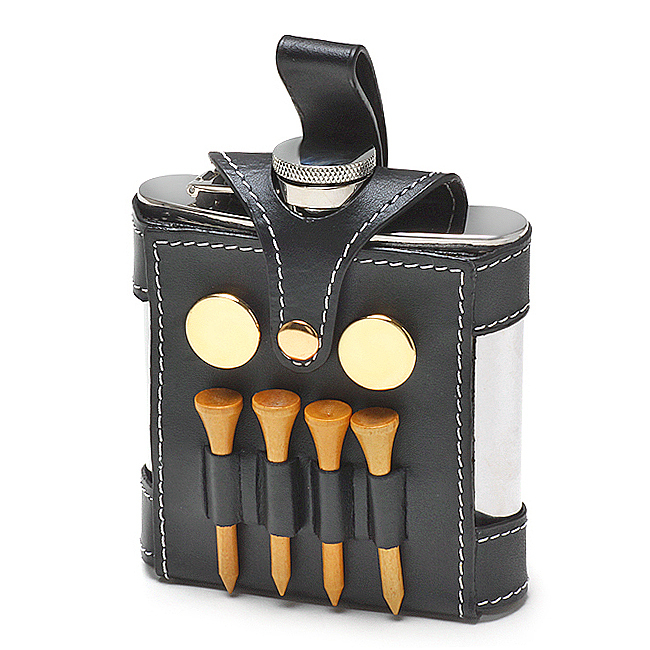 As soon as this golf flask is back in stock (we will have plenty), we'll make it available to order on our site. WILL THIS ITEM BE BACK IN STOCK SOON. We should have it back in stock within 4 weeks. It will be orderable on our site as soon as its back in stock. I was hesitant to order this because of the cheap price but the quality is actually really good. 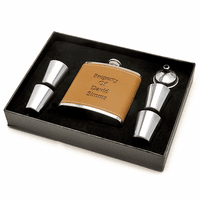 The engraving is perfect and the leather fits snug but still easy enough to take the flask out to clean it. I cant wait to give this to my bf for valentine's day! I received this product in under 2 weeks from when I placed the order. ConsThere is a lot of space between the letters and apostrophe in the engraving but that may just be the font. 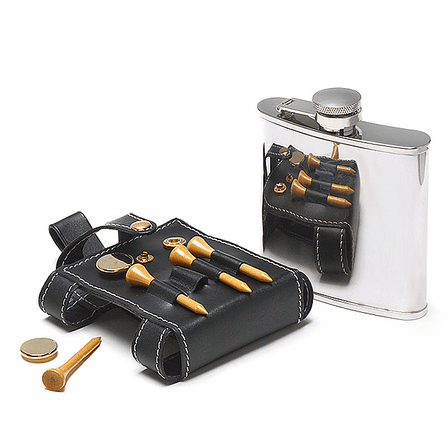 Flask and holder are great quality and look fantastic. Engraving looks amazing and the service was terrific! I am very pleased with the product, and so is the one I got it for. 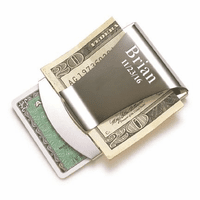 Great gift for any golfer!!! 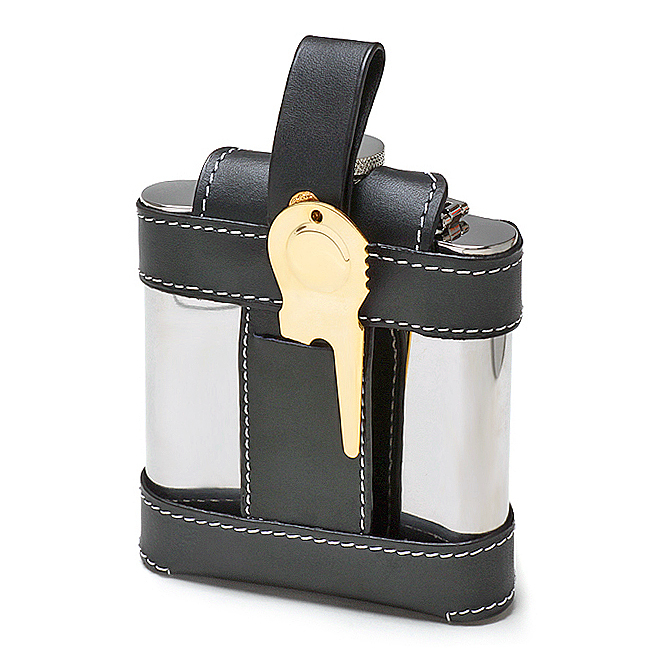 The flask with the holder is well constructed and was taken as a great gift for the ushers in my wedding. The engraving was a great touch.